Experienced dentist, Dr. Bruce Trimble, is recognizing Gum Disease Awareness Month by educating patients about the connection between gum disease and other serious health conditions. Dr. Trimble is also offering complimentary consultations to new patients who may need treatment for gum disease in Eau Claire, WI. Dr. Bruce Trimble, a dentist who treats gum disease in Eau Claire, WI and Menomonie, WI, is supporting Gum Disease Awareness Month by raising awareness about the serious health risks associated with this common condition. Besides harming tooth and bone health, gum disease has been tied to many severe systemic illnesses. Given these risks, Dr. Trimble is now welcoming new patients to visit his practice, Trimble Dental Excellence, for complimentary gum disease consultations. Gum disease is common in the U.S.; data from the Centers for Disease Control and Prevention show that nearly half of adults over age 30 suffer from it. In addition, over 70 percent of adults over age 65 live with gum disease. Research shows that these individuals are at higher risk for many illnesses, including stroke, diabetes, pancreatic cancer and heart disease. Gum disease also can cause local complications, such as tooth mobility, changes in jaw bone density and tooth loss. Given these complications, it is critical for victims of gum disease to see a dentist as soon as possible. Many adults may not realize they need treatment for gum disease because the symptoms can be subtle. Dr. Trimble warns patients to pay attention to changes in gum health, including swelling, bleeding, pain, recession and increases in pocket size. Shifts in the positioning of the teeth can be signs of gum disease, as can persistent bad breath. People who notice any of these symptoms of gum disease should protect their oral and general health by seeing a dentist for further evaluation. Dr. Trimble offers patients numerous tailored treatments to address gum disease. These include scaling and root planing, which removes bacteria from below the gumline; osseous surgery to smooth out the gum pockets and roots of the teeth; and periodontal maintenance, which keeps the teeth and gums free of infection. To learn more about these procedures, patients should visit Dr. Trimble’s website, http://www.trimbledental.com. New patients can also call Trimble Dental Excellence at (715) 235-1108 to schedule consultations to discuss treatment options for gum disease in Eau Claire, WI and Menomonie, WI. Trimble Dental Excellence is a general practice offering personalized care for patients in Menomonie, WI. 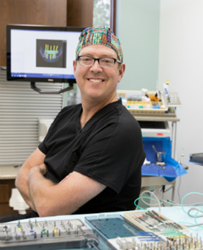 Dr. Bruce Trimble offers a variety of services, including advanced dental implants and sedation dentistry. Dr. Trimble is a graduate of the University of Minnesota and has dedicated his professional career to providing you with the best that dentistry has to offer. He is continually educating himself and his staff on the newest techniques and advances to offer you state-of-the-art, antiseptic, personalized & comfortable dental care. Dr. Trimble is a fellow of the International Congress of Oral Implantologists & the Misch International Implant Institute. He is also among the few dentists in Wisconsin who are licensed for IV sedation and has received a certificate from the Temple School of Dentistry for Surgical Oral Implantology. To learn more about the services offered at Trimble Dental Excellence, please visit their website, http://www.trimbledental.com or call (715) 235-1108 to schedule an appointment.